80 Years Ago Today, a College was Born. Imagine it is 1931 in Palm Beach County. The land bust has left many residents penniless and land speculators long gone. The Great Depression is in full swing, and just three years earlier, the worst hurricane in Florida history in terms of loss of life had occurred. So what to do to help the community prosper again? Propose something that was a radical concept at the time – establish a public two-year college so that local residents could achieve the dream of higher education for their children. This idea was quietly announced April 13, 1931 by the County Superintendent of Instruction at that time, Joe A. Youngblood. 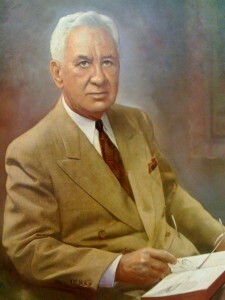 Youngblood hailed from Arkansas, and was elected in 1925 to the superintendent’s post after a successful career in insurance. Youngblood’s political advertisement from 1932 described him as “a college man”; Youngblood earned a Master of Arts degree from Vanderbilt University. 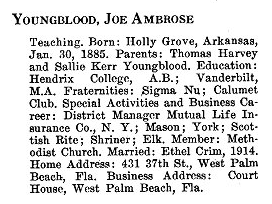 On page 7 of the Palm Beach Post Youngblood told of the idea to offer college classes at the Palm Beach High School. 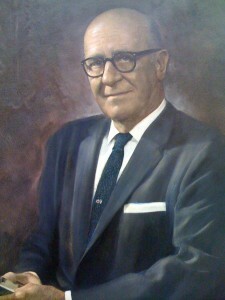 Howell L. Watkins, the principal of Palm Beach High School, and Youngblood worked together to gain support for the idea. At that time, parents had to send their children to a private college, to the University of Florida at Gainesville, or the Florida State College in Tallahassee (later called Florida State University). Many parents simply could not afford room, board and tuition during the Depression, so Watkins and Youngblood thought of offering college classes at the high school so young adults could live at home and still attend college, at least for the first two years of college studies. What we consider commonplace today in having a community college was not common at that time. There were a handful of what were then called “junior” colleges around the nation, but only one other one in Florida, St. Petersburg Junior College, which had opened in 1927 and was private. The University of Florida was a key player in helping the fledgling college design its curriculum and make sure that the faculty were ready and able to teach college-level classes. Classes started in 1933, with Watkins serving as Dean, and the entire class schedule was published in the Palm Beach Post (see below). That first semester, 41 students took classes in mathematics, science, music, education, foreign language and English. 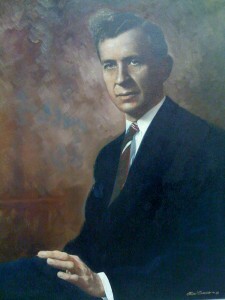 Mr. Youngblood’s wife Ethel was among the original faculty and taught German and Latin. The University of Florida continued to supervise the curriculum, and the college continued to expand its classes and curriculum.The first graduating class in 1936 numbered 3 students – Charlotte Cross, Franklin Kamiya, and Virginia Cunningham. 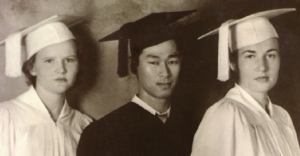 It is interesting to note that Franklin Kamiya (in the black cap and gown below) was born in West Palm Beach, and his family was part of the Yamato Colony of Japanese immigrants in the Boca Raton area, who arrived in the early 1900s. His uncle was George Morikami of the Morikami Museum and Gardens fame. instrumental for having the college accredited by the Southern Association of Colleges and Schools, which occurred in 1942. 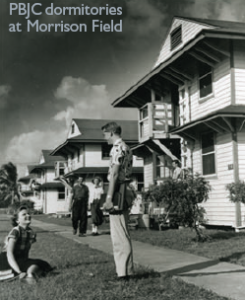 The college soon outgrew it’s Palm Beach High School home, and moved to a larger facility at Morrison Field in 1948. The mobilization of Morrison Field for the Korean War caused the college to move to the Lake Park town hall, until land was granted from the Palm Beach County Commission for the 114 acre Lake Worth site. Junior colleges continued to spring up around the state; one of the college’s 1941 graduates, James L. Wattenbarger, went on to become the architect of Florida’s junior college system through his doctoral dissertation which presented the plan that was adopted in 1958. In the ensuing decades, Palm Beach Junior College became Palm Beach Community College in 1988, and finally Palm Beach State College in 2010. Additional campuses were added in Palm Beach Gardens, Belle Glade and Boca Raton to provide easy access to all citizens of Palm Beach County. The college also has the original historic building on the Palm Beach High School grounds among its facilities. the “little college that could” has become the big college that can. I am among the over 90,000 people who have graduated from the college over the years. It is amazing how one idea can transform a community and a state through education, the greatest emancipator ever known.